A demonstration of a prototype generative music system using a variety of techniques from seeded HMM to stochastic noise. 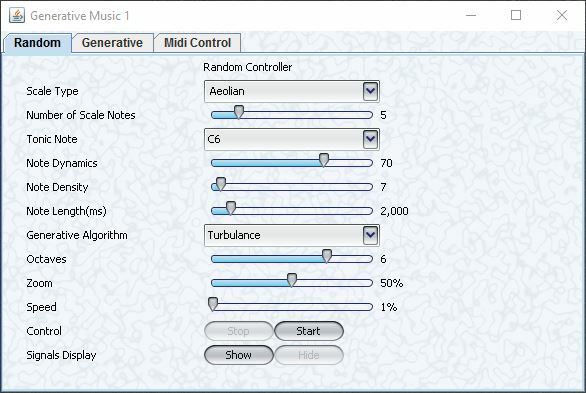 A random music generator using a variety of algorithms from a windchime emulator to stochastic noise. 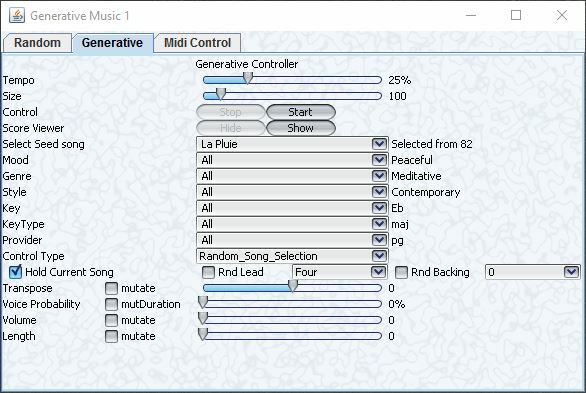 The system is built with Java, and uses an open source synth ZynAddSubFX as the sound source. It was written in 2006 based on research work I did for my Music Masters degree in 2003, and I’m currently porting parts of it to C#/Unity & HTML5/WebAudio. Generative music systems are a rich field of exploration, and the methods presented here are well known. Some screen shots are below, followed by a video that briefly explains both systems. Check out the video for a more in depth explanation.